We love hearing from our adopters about how our rats are doing. try using our new form below to submit your Testimonial information. You're more than welcome to include pictures as well. "I've wanted ratties of my own for years and in searching for a rattery, I came across outdated sites, unresponsive breeders, and began to feel very discouraged. After months and months of searching near my home in North Jersey, I decided to try PA and I came across this website and was surprised at how informative and current it was, not to mention how cute all the ratties looked! I sent an e-mail to Ashten thinking I wouldn't see a response for months or never for that matter and she replied right back to me! I was so happy that finally somebody had the decent courtesy to run their business as they claim to on their website! Within days, she answered all of my (annoying) questions, gave me many options, and we worked out plans for me to pick-up my babies. I drove almost 3 hours to pick up my 3 girls who were a part of Rebel X Karamas litter (STWR Daydreamer [Mileena], STWR Someone Like You [Kitana], & STWR Don't You Remember [Jade]) and though it was a long ride, it was so worth it! I knew I could trust Ashten before even meeting her! As a cat lover and owner, I was afraid that the ratties were never going to get used to the scent of predators in the house. At first, they were nervous, timid, and hiding which was expected but after just 2 weeks, the girls were fighting to be the first out of the cage every time I walked past. They now enjoy riding around on my shoulders even when they are within feet of the cats. It's simply amazing how different their personalities differ from one another and to see how they interact during play time. My nieces and little cousins who frequently visit absolutely love them and always beg me to take them out and play whenever they are over. The ratties are so sweet and love the attention. A lot of my friends who were grossed out by the idea of rats have now learned to love them and ask to carry them all the time. It feels good to change people's uneducated negative opinions to positive! If I decide to adopt more ratties (which I get the urge to do every time I see new available babies), I would rather drive the 3 hours there & the 3 hours back to NJ other than pulling teeth to get an answer from somebody closer because I know I can depend on Sweet Whispers to get the job done right!! Thank you so much!" "We want to thank Ashten for all the care she took raising my 2 baby girls back in February for their first 6 weeks, they had a tough start but are as strong as any other now. I have had pet store rats in the past and they were cute of course, but the girls I adopted from Sweet Whispers Rattery are the most fun and social rats I have ever been around. They have two very different personalities and love to be out of their house and play with us on the couches. My boyfriend said that having rats is so much more fun then he thought it would be and we take plenty of pictures of the little ladies being silly. They love to sleep curled up in their hammock together. I would recommend Sweet Whispers to anyone looking to share their home with some of these cute critters. Ashten was a huge help with any questions and truly cares about all her animals and their well being after the adoption process. Thanks Sweet Whispers!" "As a college student who loves animals, I decided to adopt a pair of rats for my apartment. I knew I wanted to adopt from a breeder and applied to both Blue Skies and Sweet Whispers Rattery. Blue Skies Rattery was closer to my area, but they were no longer breeding, so I went on to adopt from Sweet Whispers, and I'm so glad I did. I loved the website and knew right away that the rats I would be adopting would be healthy and friendly. All throughout the adoption process Ashten was there for any questions I had, and always responded back quickly. On the day that I adopted my two girls, I was so excited and couldn't wait to take them home. My girls, Annie and BoBo, are absolutely beautiful and I fell in love with them from day one. Ashten's been there whenever I had questions, and she's given me a lot of advice and information to ease my mind of any worries. Both girls are doing so well and growing more and more each day. I LOVE my girls. Every night after I let them run around (they're FULL of energy!) they crawl up on me and I snuggle and pet them until they fall asleep. They are just adorable, I couldn't be happier with them! My friends and family love them as well, and I've converted them into rat people :) I'm so glad I adopted from Ashten, and if I chose to adopt rats in the future I know I'll get them from her. As for now I'm looking forward to enjoying these next few years with my girls!" "My boyfriend and I didn't start out looking to adopt from Sweet Whispers Rattery. At first we were trying to adopt from another local breeder and it just seemed like everything they said wasn't adding up, excuses being made, and in the end letting us down by not staying organized and not realizing which of their rats were already promised. We got to the point where we almost decided to give up, but then I decided to contact another rattery, that sent the message on to STWR, and nearly immediately I received an email back from Ashten. She always worked with us, giving us the best answers to our questions, and helping us as new rat owners. She was flexible and responsive, even when things in her own life were overwhelming. She was helpful, considerate, and eventually helped us find our two boys (now named Riley and Ramza). I honestly don't think I'll get my ratties from anywhere else besides Sweet Whispers. I've never seen rats so sweet, and outgoing! Not to mention curious and intelligent! They were healthy, and well maintained while in her care, and she helped us to know how to continue that care when we took them home. I'm so grateful that she trusted us with adopting two of her boys, and look forward to the future when we have the space and time to adopt some more! If you want a place where you know you can trust the quality of care as a breeder, Sweet Whispers is where you should go." "I am so grateful to Ashten for all her advice and expertise. She helped me after the loss of one of my rats with patience and insight. When I was ready to adopt two more ratties, she guiding me through my options, adoption, and introductions to my older rat. The two little little girls I adopted are fuzzy angels! Their friendliness and sweet dispositions are a testament to the quality care they received from the start. Sweet Whispers is a responsible and quality rattery, that I would recommend without any reservations." "Sweet Whispers Rattery is the best rattery in the area! It was important to me to deal with a knowledgeable breeder that ethically and humanely does business. Ashten came recommended by Robin from Blue Skies Rattery in Lancaster, PA and by Kelsey from TOPI Rats in Portland, OR. Ashten is a very dedicated and conscientious breeder - I have been very impressed with the care and concern she takes for all of the rats that come out of her rattery. I have adopted 6 female rats from her and they have all been extremely healthy and sweet! They love to be with people and have been a joy to have in my life. Thanks Ashten!" "My wife and I were in need of two or three baby girls to provide company to our lonely girl Philly. Philly's sister had recently passed suddenly leaving her all alone. On top of that my chocolate lab passed after thirteen great years a week before Philly's sister. It was getting lonely in our home that was filled with animals and while I was not ready to get a new dog yet we needed some company and Philly needed companions. I contacted multiple breeders and did not receive much response. Ashten got back to me very quickly, was incredibly understanding of our situation, and of our desire to adopt quickly. She was extremely helpful and accommodating. We quickly made arrangements to adopt three baby girls. I have to say all three girls are really great. They are really sweet and friendly. They are very socialized and really outgoing. Each one has such a unique personality. Also they are very healthy and have a very nice appearance. We could not be happier. After quarantine we introduced the three babies to our older girl Philly. We expected some fireworks at first, but everyone got along perfectly as if they were long lost family from the second they met. Philly immediately took a very motherly role with all three and they follow her everywhere. We often find a pile of rats laying in a nest or the hammock sleeping (usually Philly who is a big girl has a pile of babies sleeping on top of or nestled against her). It has been great having the three new girls, but most of all it has been so nice seeing Philly happy and re-energized. She had taken to just hiding in the nest all the time after her sister passed and she was alone. Now she is a completely different rat thanks to her new friends. She is very social and has so much more life. It is a pleasure walking by the cage to see three babies jumping all over looking for attention and Philly acting the same way as if she was only a few months old as well. I cannot thank Ashten enough for all the help, the quick response and reaction, and especially for the three great babies. She clearly is a top notch breeder in every aspect with rats and customer service. Even though she is two hours from my home it was well worth the trip. The next time we are looking for new babies I plan on gladly making the drive again. It is well worth it to go with someone you trust and know does a good job." "I absolutely love animals, so I always wanted to have pets, but sadly the last time my family had "real" pets was when I was pre-school age. We had two guinea pigs, Flower and Booboo, but they were both gone by the time I was in kindergarten, so I was really too young to fully appreciate them... Ever since they passed, all my brother and I have had were frogs, sea-monkeys, triops, hermit crabs, and most recently, crayfish. So, realizing I was stuck with a "cage critter," I started researching various pets. Different animals were crossed off the list one-by-one, and eventually I ended up with - you guessed it - rat. I started doing more rat-specific research and eventually found Ashten's rattery as a reputable source of ratties. I have to admit, I was originally going to adopt from a pet store, but I am SO glad I chose Sweet Whispers Rattery instead! Ashten was everything I expected in a reputable rat breeder - and then some. There's no doubt she cares about all of her little critters. She made sure I had all of the information I needed and there were times where I know she was questioning me as an adopter. Although I was pretty sure I'd make a good rat "mommy", she wanted to make sure the babies were going to a great home. Also, even though I feel I did a pretty significant amount of research, I still had a lot of questions, and Ashten answered each and every one in detail and was always patient. She definitely knows what she's doing. 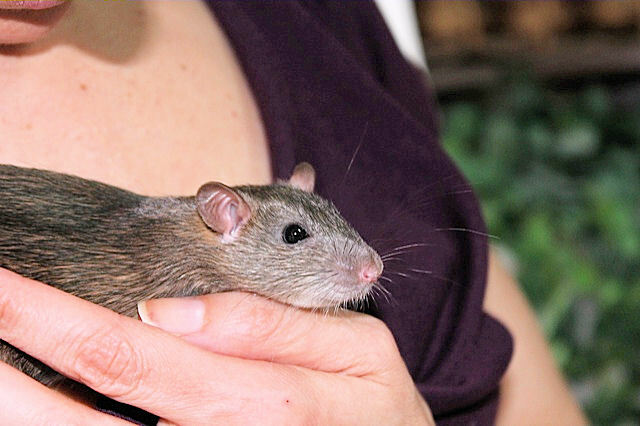 The rats themselves also show how caring Ashten was to them to ensure they would be friendly in their new homes. My girls, Sunny and Bonsai, were a little shy when I first brought them home, but that was to be expected. Within a few days I had them eating out of my hand and greeting me as I entered my room. Within in a little over a week they've both rode my shoulders around the house and use me as a jungle-gym during playtime. It's a great feeling, and you can really tell that they were raised and handled in a very loving environment. Finally, if you are questioning rats as pets or simply don't know what pet to get, rats make wonderful companions. I've only had my girls for almost three weeks and it's already clear how amazing these animals really are. You can ignore most, if not all, of the stereotypes involving rats... They are smart, friendly, affectionate, inquisitive, playful, clean... the list goes on. There have been many times where my girls' silly antics made me laugh out loud, and when my special crayfish died a week after getting them, they really helped me feel better. They might be small, but they have very big personalities. If you're looking to add furry friends into your life, you should not only definitely get rats, but make sure you adopt them from Sweet Whispers Rattery. You will not regret it!" "When most people hear that I adopted two rats they think I'm crazy, but my beautiful baby girls, Willow and Freya, have won over every single person with ease. They are both such friendly energetic little girls who have more kisses to give than any one person could ever receive! I did lots of research on both rats and breeders before I adopted and Sweet Whispers really stood out to me. I had a gut feeling that this was the right place for me to adopt from and I was right! I am so grateful for not only my sweet babies but also how amazing and helpful Ashten has been both through the adoption and since. 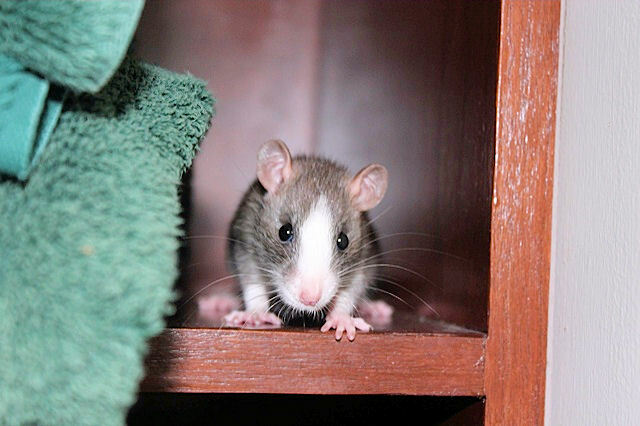 I am in the process of adopting a retired rat from Sweet Whispers and cannot wait to meet my new little baby!" "After searching for a high quality rat breeder in my area, I came across Sweet Whispers Rattery. I found a couple other rat breeders in my area and I looked at Pet Stores. The website of Sweet Whispers Rattery won me over. All of the rats on the site were beautiful rats with amazing colors. The whole transaction of buying my rats from Sweet Whispers Rattery was very easy and I was scheduled to pick my rats up at my convenience. In the past, I have owned Pet Store rats and what I found was that my Pet Store rats had rougher fur and were less social for a longer period of time. The rats I brought home from the Sweet Whispers Rattery had the softest fur I had ever felt on a rat and they all were very curious and social. All of them loved to be pet and to just relax with you. I would definitely go back to Sweet Whispers Rattery when I buy my next rat." 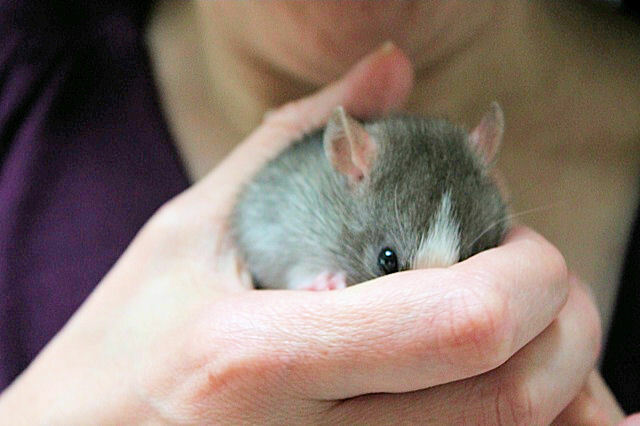 "I found Sweet Whispers Rattery while searching for a PA breeder close to me. I contacted Ashten and she not only hooked me up with the greatest little buddy, but provided me with so much information and tips for rat keeping! It's been over a year and half since I took River home and he still is my best friend. River is currently about two and half years old and he is slowing down but I assume I still have quite awhile left with River to enjoy! If you are looking for a responsible, respectable, intelligent, and helpful small scale breeder, I couldn't recommend anyone better than Ashten at Sweet Whispers Rattery!" 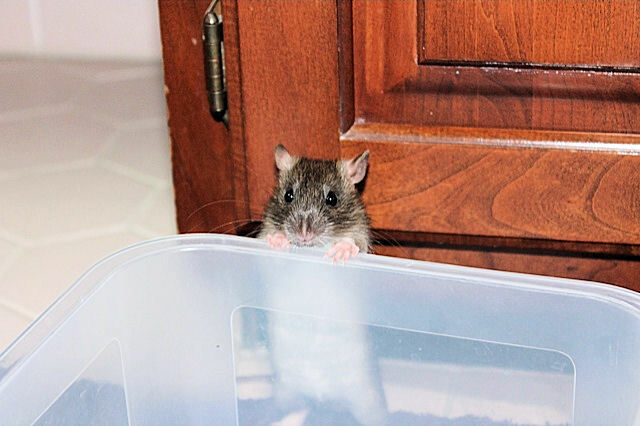 "Being a first time rat owner, Ashten answered every question that I had about rats in great detail. She is a very knowledgeable breeder and the boys (Baily and Burbon) I got from her have wonderful personalities, not to mention they are beautiful! I couldn't ask for any better companions. She cares about what she does and is devoted to producing quality over quantity. I plan on getting the third addition to my rat pack from her soon! I would recommend this breeder to anyone looking for high quality sweethearts." "Thank you so much for the beautiful ratties! Mocha and Treasure (Or Glinda and Elphie, as I have now named them) are so sweet! They wait for me after school, and even my friends (all of whom do not like rodents) thought that they were cute. In fact, my two best friends were fighting over who got to put their hand in the cage! I love them both so much." "I adopted Roman and Storm from Ashten a few months ago. I fell in love with them as soon as we brought them home. With rats you can't have just one... or two, so I got the Critter Nation double unit cage and drove 2 hours to PA to adopt two more babies and came home with four! Each one of the boys has such different personalities and I just love them all. I am so glad to have found someone so knowledgeable and patient who has always steered me in the right direction." "It was an absolute thrill working with Sweet Whispers Rattery. Throughout the adoption process it was very evident they care deeply about the rats they breed. We have been very happy with Winter and Snowflake our two female Siamese. If you are interested in adopting a rat I highly recommend them." "I've had rats before but this has been my first time getting rats from a breeder. I have to say, I can definitely tell the difference from pet store rats. Although all my pet store rats turned into great pets, it is great to have babies that aren't scared of you and want to be cuddled. I traveled up from Norfolk, VA, making it a 6 hour drive one way. I had been talking with several ratteries, but many had breeding issues or changes in schedules. I was hoping to get some during my break (I'm in college) and ended up finding STWR. Last weekend I adopted Basil (STWR Jack Frost) and Nutmeg (STWR Tannon). It was more than worth the drive! The babies were so licky and cuddly as we transported them home, not to mention handsome! I'm having a great time getting to know them and can't imagine any sweeter rat babies! Thanks for the great pets!" "What an eye opener this has been. I decided to go with rats because my kids needed a small animal pet, and I despise hamsters. I didn't realize what sweet, loving, intelligent creatures they really are. They are less than 2 months old, and already they know their names and they reliably obey the word 'no'. My 5 and 3 year old kids absolutely adore them, and they have never once been bitten or even nibbled! You do need to watch your kids closely during handling - for the rat's safety, not your child's - until you feel certain your child won't mishandle it. This cannot yet be achieved by my 3 year old, but my 5 year old hardly needs watched any more. They are also so solidly healthy, and it's great to know that the lines they came from are not riddled with problems. This is important, because for instance, some lines are prone to develop tumors at young ages. What pet store knows this about their rats' backgrounds? Excellent experience with solid communication even after the sale from Ashten, along with in depth and ongoing guidance on their husbandry, which is basically a simple thing - they have no smell at all if their cage is kept reasonably clean. I HIGHLY recommend Ashten's lines, as she does keep excellent track of everything - and she can tell you the strengths and weaknesses of the line you choose. She cares; this is what makes her rattery special. I did a lot of research before settling on my family's very own pair of Sweet Whispers rats." "Within the first few moments of having our little girls we were in love with them. They are incredibly affectionate, smart, and they come with us everywhere we go. They each have unique personalities with their own little quirks, but all three of them are very sweet. They love to nap on us or romp around on the couch, bed, or my laptop keyboard when I'm trying to write emails. As first time owners we've had tons of questions and Sweet Whispers has been incredibly helpful and patient, thank you so much for what you do!" "Mocha may be small but shes mighty, jumping from couch to couch in my living room getting into all kinds of trouble. Penelope loves attention and really enjoys her yogurt drop treats. They both enjoy curling up in their sleeping bag together." "They're incredibly friendly and fun, and we're all really enjoying them. Here they are snuggled up in a tiny little house in their great big cage." "I just wanted to send a quick note about the two male rats I got from you back on October 16th. They have settled into their new home quite well and seem to look forward to their 'playtime' outside the cage every day with me and random toys or mazes I make for them. They are everything I expected and more. They have such good personalities, healthy, very friendly and oh so curious. I don't think I would have had such a good experience from a pet store and I thank you for what you do." "Norbert and Scabbers are home and very happy! I wrapped the cage with 1/2 by 1/2 inch wire like you suggested, and it worked great! It took me 5 hours of work! But the ratties are happy. They are sweet and very tame. We can tell that you did a good job socializing them!" "Ashten is an excellent breeder. She went out of her way to help our family adopt our rats, and she was great with communication throughout the whole process. She has also helped us with questions after we returned home with the rats. I recommend Sweet Whispers highly." "Wow are the babies cute... and healthy, shiny, active, curious and wonderful! Elizabeth and Anna are so happy to have them. The whole family is in love! Introductions went well and I think Little Chestnut is happy to have some buddies around again. Thank you for answering all of my questions, and for raising quality ratties. I hope to keep in touch so you can see how they are growing. Thanks again." "Just wanted to let you know the boys are settling in nicely. They are insanely cute and extremely well socialized. Thanks so much!" "Rosalie is doing so well. Always eating and running around chasing the other girls. She's my little baby. She is just so cute. I will keep you posted on how things are going. Thank you much." "Heya! We got the girls home safely. We are really impressed with them. They're pretty advanced, super friendly and already playing with our hands and such. They're more developed personality wise then my girls when we got them at 3months old. They're so awesome!" "They have been the most personable babies The boys are so cute they say good morning to me every day. All through the day they are always looking for attention. The girls make it almost impossible to clean their cage because they want to see EVERYTHING I am doing and playtime is so much fun. The girls are little adventures. They have made it their mission to get off my bed and explore makes it a challenge to keep up. The boys want to just explore my pillows." "They are adorable, sweet guys, they obviously were treated well and handled regularly by you as their breeder. They are very well socialized, and we are enjoying getting to know them. Thanks!" "I am a repeat adopter of Ashten at Sweet Whispers Rattery. You know you are getting a pet that's been bred for gentle temperament as well as personality and good health." "We ended up naming the girls Emmy & Maggie and they're doing great and are very playful and affectionate. They love giving kisses! Everyone that meets them ends up falling in love with them and thinks that they're really cool pets (even if they initially were put-off by the idea of having rats as pets). Thanks for raising such sweethearts." "Thank you so much for the little girls they are the best. Both of them are amazingly handled and I would recommend Sweet Whispers Rattery as a breeder to EVERYONE!!!!" "I was in the market for two dumbo female rats, Rex was my preference but smooth coat would have been ok too. I filled out applications with three local (PA area) breeders, and seemed to have no real issues getting a rat from any of these breeders. One breeder in particular stood out to me and that was the wonderful lady at Sweet Whispers Rattery. First let me start out by saying that just about every local breeder was recommending this rattery for quality pets. One breeder I filed an application with said that she didn't currently have any babies available, but knew of a rattery that did. Fortunately, I already had an application in with her, so the ball was already rolling!!! I contacted Ashten and arranged to pick up my two little girls. Mind you, I am a rat mommy virgin! These two girls would be my first.... and like any virgin, or first time mother for that matter, I was a bit clueless. Mind you, I had done my research, but needed some coaching to get me right on track. Ashten was there every step of the way! I remember one moment where she TOTALLY put the love of her ratties over the value of the sale..... and that is not a quality you often find in a breeder! This is when I KNEW I had made the right decision, to get my ratlings from Sweet Whispers Rattery!! I took the 2.5 hr drive (gotta love explaining to co-workers that your taking a vacation day to pick up two rats) to get my girls (AKA Butters and Belle). I got my girls, filled out the necessary adoption papers and I was on my way. Another thing that was awesome (for me) was that her little girl had no problems handling the ratties. Her daughter is about the same age as my son, and ultimately these girls were to be his pets under my supervision. In actuality, they are still his pets, but they have captured my heart... no really, a rat can capture your heart. I send pictures to Ashten routinely and she is always excited to see how big they are getting. I want to thank Ashten for her kindness, patience, and time! Without it, I'm sure I wouldn't be the rat momma I am today!! I will be getting my next 1 (maybe 2) girls in the coming months, but only from one breeder.... my friends at Sweet Whispers Rattery!!!"